Triangle Collision is a member of the Assured Performance Network, making us the area’s most trusted GM body shop for all GM brand vehicles. Whether you drive a Cadillac or a GMC, we have the trained technicians and facility needed to restore it to pre-accident condition. We understand that your GM vehicle is a significant investment, and are confident that you will be satisfied with the quality of our service. We offer Lifetime Warranties for our repairs and paint services. This way you can rest assured that your vehicle will be repaired to pre-accident condition. . Unlike many body shops, Triangle wants our customers to know what we are doing throughout the repair process, and are always open to answer your questions. We believe that your GM vehicle needs to have its performance and safety features restored to as they were before the accident, if not better. We back our work with a Lifetime Warranty because we follow GM’s suggested repair guidelines for every make and model. Especially today, not all vehicles are made equally. Each model requires specific knowledge of how to safely repair each component. It’s your choice, not the insurance companies, where your vehicle is repaired. 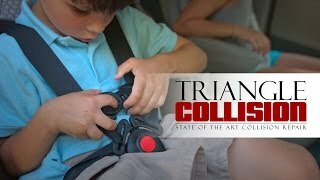 Choose Triangle Collision, the Cary, NC area’s premiere GM Body Shop & Collision Center. Our technicians have gone through extensive training to learn how to repair all GM makes and models. We have also invested into the equipment needed to restore these vehicles to like-new condition. We do this because it is our mission to not only restore your vehicle, but your peace of mind as well. It’s important to know that your safety features have been repaired the right way. You can only guarantee this at a GM Recognized Repair Facility. The safety and performance of your GM is important, but you still want it looking good, too. We have an in-house paint and refinishing area equipped with industry leading BASF technologies. We will match the original color of your GM while making sure it looks just as fresh as it did when it left the showroom floor. Let us take the stress of dealing with the insurance company off of your hands. We understand the claims process and will work with the insurance company to get your GM vehicle back to pre-accident condition.